We take great pleasure in inviting you to the 14th Australian International Shell Show to be held in Adelaide, South Australia. The Shell Show is an opportunity to renew acquaintances from interstate and overseas, as well as the pleasure that will be experienced from viewing some of the world’s most beautiful and rare shells. 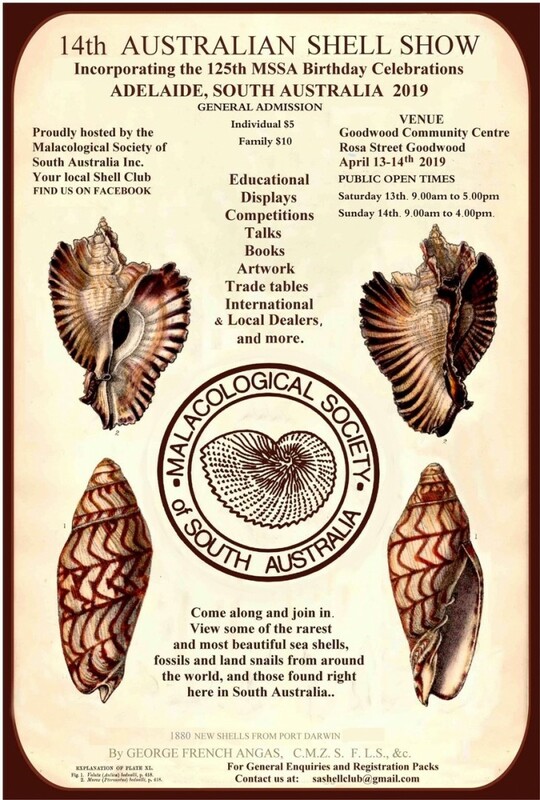 The Malacological Society of South Australia Inc. (MSSA) is dedicated to fostering the study and appreciation of marine, land, fresh water and fossil molluscs. 2019 marks the 125th year of the MSSA existence, so it is fitting that we have the opportunity to host the annual shell show.